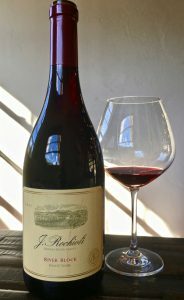 2011 J. Rochioli, Pinot Noir, River Block, Estate, Russian River Valley. The remarkably fresh 2011 River Block estate grown Pinot from Rochioli, is at a great point right now, just now beginning to show a brick orange hue on the edges, while the palate has retained a youthful flourish and vivid floral perfume. The fruit is sweet and polished, framed by smoky wood and a deep rose petal aroma with some Grand Cru intensity that even now brings a touch of bacon fat and it still has some muscle, in fact it reminds me little of a Ann Gross Richebourg and a Elio Altare Barolo! Which in a way makes sense as both those wine are a touch oaky and the 2011 vintage was unusually cool throughout, highlighting brisk acidity, which has preserved this Rochioli River Block well, it’s a wonderfully drinking wine, with impressive mouth feel, that has intense palate impact and stunning length. One of California’s top Crus, the Estate River Block Vineyard is set close to the Russian River, hence the name and benefits from a slightly cooler effect and while still warm for Pinot this spot has a stellar track record for great wines and this one starts out with it’s pedigree showing with lush textures, bright focus and expansive layers of dark fruits, and while it fades off a bit with air, it is drinking at its best right now. The color is vivid and shines in the glass with a dark garnet hue and it pumps out black cherry, plum and dark berry fruits along with the toasty wood, an array of brown spices, light mineral tones and dried violets, adding black tea and anise. The vintage markers still holding here, with some racy acidity helping curb the density of this wine, this is a year that goes up and down and is an out of character year for most producers in the region, but Rochioli’s River Block still possesses its historic personality and opulence with a serious presence. If you have 2011 Rochioli Pinots, it’s time to bust them and be sure to have a matching meal to experience them at their very best.